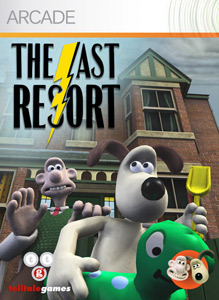 "Join Wallace & Gromit in The Last Resort™, the second tale in their newest adventure series. When unrelenting rain ruins their holiday plans, Wallace & Gromit transform their cellar into a makeshift resort. After a customer is clocked on the head by an unknown assailant, it’s up to Gromit to find out whodunnit… with a little help from Wallace’s latest invention, the Deduct-o-matic!" 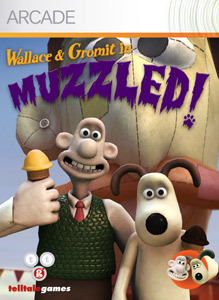 "Join Wallace & Gromit in Muzzled!™, the third of four grand adventures! This trial gives a taste of the excitement with several scenes from the first Wallace & Gromit episode. Explore the vibrant world of West Wallaby Street via Wallace’s latest invention, Interact-o-vision. Meet a few of Wallace’s unconventional neighbors and help Gromit save his master from a giant bee attack! Each game in the series has a brand new story with the same slapstick, humour, cinematic visuals, and charm that fans of the Wallace & Gromit films have come to love. Play all four of Wallace & Gromit’s Grand Adventures!" "Join Wallace & Gromit in The Bogey Man™, the final tale in their newest adventure series by Telltale! When the Morning Lamppost announces the upcoming wedding of Wallace and his neighbor, Felicity Flitt, the inventor is as shocked as anyone. It’s up to Gromit to extricate his master from this tangled situation, but his plan plunges Wallace into a new thicket—“Prickly Thicket”, a country club rich in history, mystery and malice. Wallace and Gromit will have to solve an ancient mystery, compete in Great Britain’s craziest golf tournament, and face off against a diabolical machine!"